Clonezilla is a fantastic tool aimed at cloning hard drives and partitions, and afterwards, being able to recover them at the moment you want. It is based on several open source solutions such as partclone, partimage, ntfsclone and dd. The target of this article is to explain you why I have had to use this tool recently, :). I have started to work in a new company last month. I received a new laptop with Windows Vista as operating system. I was working with it during the first week, then I installed Ubuntu 12.04 on a memory stick and I have been using it so far, and now, I have decided to install Ubuntu directly on the laptop. What are the reasons? Windows Vista is terrible in order to work, spends a lot of time throughout the booting, runs very slowly and is not practical for the work that I have to carry out. Also mention that I am really surprised with Ubuntu running on a memory stick (USB 3.0), because the performance is pretty good, but the main handicap is its size (32 GB) and the requirements to work with virtual machines. So what are the steps that I have had to follow up? First of all, to make a backup of the entire disk through Clonezilla so as to be able to bring it back later. Secondly, to convert the Windows installed on the laptop into a virtual machine by means of VMware Converter. And finally, to install Ubuntu on the laptop. I also have installed VMware Player in order to be able to run that VM. So as to clone the hard disk, I downloaded Clonezilla (1.2.12-60) and burned it on a memory stick, by means of UNetbootin, to be able to create a bootable USB flash drive. Once I had a Clonezilla Live media, I booted it on my laptop. After booting Clonezilla, choosing the language and the keyboard layout (don't touch keymap), you have to select the option of Start_Clonezilla and device-image, in order to clone the disk by using an image. Before cloning, you have to assign where the Clonezilla image will be saved to. In my case for example, I chose local_dev because I wanted to store the image on a external disk. For this purpose and after pressing the Ok button, I inserted the USB device into the laptop, and the operating system automatically detected the USB disk and mounted it as /home/partimag. Then, I had to pick out the partition of the external USB hard drive where I wanted to mount the aforementioned directory. 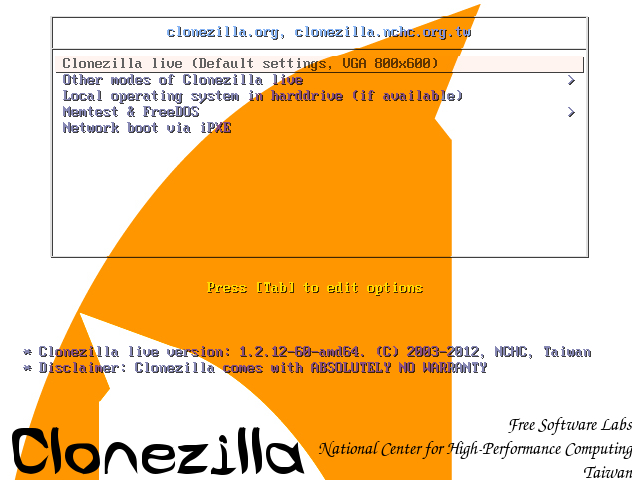 On the next screen, the first time that I run Clonezilla I chose Beginner mode, so as to accept the default options. That was an error because Clonezilla was not able to recognize the file system used on the disk (as I mentioned before, it was cyphered), and it failed. Therefore, I had to select the other one, Expert mode, and in this way I was able to make the copy by fitting different parameters. The following step is to choose the option savedisk, to be able to store the local disk as an image. Then you have to input a name for the saved image and select the source disk that you want to back up. Now you get to the Clonezilla advanced extra parameters, whereby you can decide what cloning programs and priorities you prefer. Because the hard drive was encrypted, I had to pick out the "-q1" option, in order to only use dd to clone the disk. The next screen allows you to set various parameters about the cloning method (I left the options which come by default). And finally, you have to select the compression option. I went with the last choice, -z0 (no compression), because I preferred to manually compress it after the cloning. Below you can appreciate the command executed (bzip2 compression). And this is the structure of files generated by Clonezilla. Thank you for this post. I would have never found the '-q1' option on my own. I was able to clone my Safeboot (aka - Symantec Endpoint Protection) encrypted drive onto a new drive with no issues.